The Debian Project announced the release of Debian 9.6 on November 10, 2018; it is the sixth release of Debian 9 which was released in 2017. Debian, one of the oldest GNU/Linux distributions that is still in active development, is the basis for other GNU/Linux distributions such as Ubuntu, Kali Linux, or Tails. The new version of Debian 9.6 is available as a standalone ISO image download and the included update manager that administrators may use to upgrade to the new version. Debian notes that the new package includes updates but does not "constitute a new version of Debian 9" and that old Debian 9 media remains valid when it comes to running or installing the operating system on devices. Downloads for all sorts of Debian versions are provided on the official download page on the project website. Users can select to download small or complete installation media, cloud images for online purposes, and there is even an option to buy a set of CDs or DVDs if the Internet connection is not super-fast. If older Debian 9 media is used, admins are asked to run the update manager so that any missing packages get downloaded from the Internet to update the installation to the latest version. Additional data needs to be downloaded if the small installation ISO image was downloaded and used to set up a new Debian system. 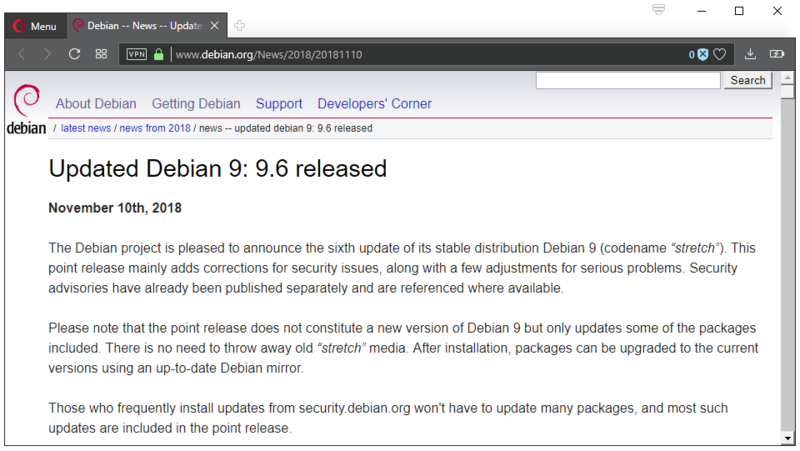 The Debian project is pleased to announce the sixth update of its stable distribution Debian 9 (codename stretch). This point release mainly adds corrections for security issues, along with a few adjustments for serious problems. The changelog lists a huge number of security updates for various packages included in Debian. Components that include security updates include Firefox ESR, Wireshark, Imagemagick, Thunderbird, Xorg Server, or Curl. Security updates aside, a large list of packages was updated as well to address issues in earlier versions. While it would go too far to name them all, the list includes Apache2, the debian installer, fuse, grub2, opensc, and rustc. Debian 9.6 is a security update that brings installation media up to date. Existing Debian installations may be updated using the update manager. Yes, I’ve been happily using Debian for at least a decade now. However, I’ve been engaging in active planning to switch to a different distro, because of systemd. I just haven’t yet decided if it’s going to be Slackware or to move to BSD. Personally I’ve considered moving to Parrot Home, if they decide to jump on the Devuan bandwagon. I like the security focus and how user-friendly it is. Due to work I unfortunatly had to go the other way; from BSD to linux. Before then, I ran BSD for about 10 years, it is bullet proof and probably the most stable OS I’ve ever used. It also feels really good using it because most of the devs are decent and there’s no arrogant, loud, angry dev who stands out on the team (plenty of nerds though!). If you need a shell, xfce is very light and works excellent over BSD which is my alltime fav user combo. The bsd cli is very much like linux but uses different terms, conf file extensions, etc. Yes, I know quite a few people who use BSD, and it is quite attractive! Particularly for the community — it seems that the serious Unix nerds are almost entirely on BSD and, as you say, things in that crowd seem a lot less juvenile than in the Linux world. @Martin: what’s happened to Mark Turcotte? Debian 10 is very stable here, but I had to switched off auto upgrade without my consent (changing names of some files, not deleting them or run “disable” option). Debian isn’t free from idiocy, too. linux-image-4.18.0-1-amd64/4.18.8-1~mx17+1 with zero issues. Installed with Synaptic Package manager GUI. The best part is NEVER have package conflicts! Also use GNOME System monitor, Geany, Htop. This combination evades/drives Google nuts! For SOTA multimedia playback on any PC or Pi3, try libreELEC (Kodi 18.0/Leia). Based upon a slim-down Debian running kernel 4.18. Turnkey solution. Be up running in 10 minutes using Intel or Nvidia graphics. Beware if you’re using headphones in Debian. There is a pulseaudio bug that will suddenly increase the volume to 100%. If you have a good quality sound card, it will feel like listening to a sudden explosion next to your ear. The packager ignores bug reports even from a debian developer. Use Ubuntu or Mint instead. At least, they care about desktop users. Hehe that issue was reported in 2016 and hasn’t had activity since 2017. Guess I’ll start looking at alternatives. This is not unique to Debian. Here’s a fix that worked for me. Open /etc/pulse/daemon.conf as root in a text editor. Change the ‘yes’ to ‘no’, delete the semi-colon at the start of the line. This is the future of systemd, where Lennart’s ambition outpaces his lackluster programming skill and he abandons yet another broken mess — just as before with avahi and pulseaudio — and moves on to another newfangled project with little or no technical merit, where he can once more bring to bear the only real genius he has — the political manipulations of a sociopath.